You'll love these easy dinner ideas, including baked pasta, sheet-pan chicken and slow-cooker meatballs, from Julia Turshen, Giada de Laurentiis, Kevin Curry, and more food pros. Everyone struggles to get dinner on the table night after night — yes, even top chefs and other food professionals. And during the hectic holiday season with all the focus on feasting and parties, it's even harder to plan regular meals. Here, chefs and other food pros, including Julia Turshen, Giada de Laurentiis, Kevin Curry, Michael Solomonov, Steven Cook and Lindsay-Jean Hard, share their favorite quick and easy dinner ideas — the tried and true dishes they turn to when their lives are busy. With these recipes for baked pasta, sheet-pan chicken, eggs for dinner, slow-cooker meatballs and more, you'll have dinner ready in less than the time it takes to stream a sitcom. Don't be scared off by the word "celebration" in the title of this recipe from Julia Turshen, the author of numerous cookbooks, including "Feed the Resistance", "Small Victories" and "Now & Again", as well as the founder of Equity at the Table. While the dish is fit for a party, it's far from fussy to make. "This is the easiest thing to make for a group, whether it's a weeknight dinner or a celebratory meal," says Turshen. "You get a main dish (chicken) and a side dish (sweet potatoes and dates) in one and you mix everything directly in the roasting dish and set it and forget it — no bowls to clean or anything. So easy and so good. I make this over and over again." When you don't have an hour and a half to make Giada de Laurentiis' traditional chicken tetrazzini, this simplified stovetop version is the perfect solution. "This is my classic recipe, adapted to be even easier for weeknights," says the TV personality, cookbook author and restaurateur. "I use rotisserie chicken to speed things up. The cleanup is a breeze." Hummus can be way more than a snack, especially if you throw a few toppings on it and serve it with bread or pita. "A plate of hummus with apricots and pine nuts doesn't need more than a couple of ounces of ground beef seasoned with Turkish coffee to make a convincing dinner," Michael Solomonov and Steven Cook write in "Israeli Soul", the follow up to their James Beard Award-winning cookbook "Zahav". "And vegetarians and vegans can rejoice in a world where hummus topped with avocado and peanut harissa exists." Israeli Soul offers up 24 hummus topping ideas, including spiced carrots, corn salad, lima beans with tomato and cinnamon, roasted butternut squash and chicken salad with tahini. Use your imagination and your leftovers: A plate of hummus with leftover cooked vegetables, a couple of hard-boiled eggs and a drizzle of olive oil is a hearty, healthy and protein-rich dinner that'll power you up for whatever your evening holds. "This one-pot pasta goes from prep to table in 20 minutes flat," Giada De Laurentiis says of this speedy dish made with tiny orzo pasta, frozen peas and cherry tomatoes. "Orzo cooks quickly, and the tomatoes and peas add a healthy serving of veggies. Bonus: Kids love it!" 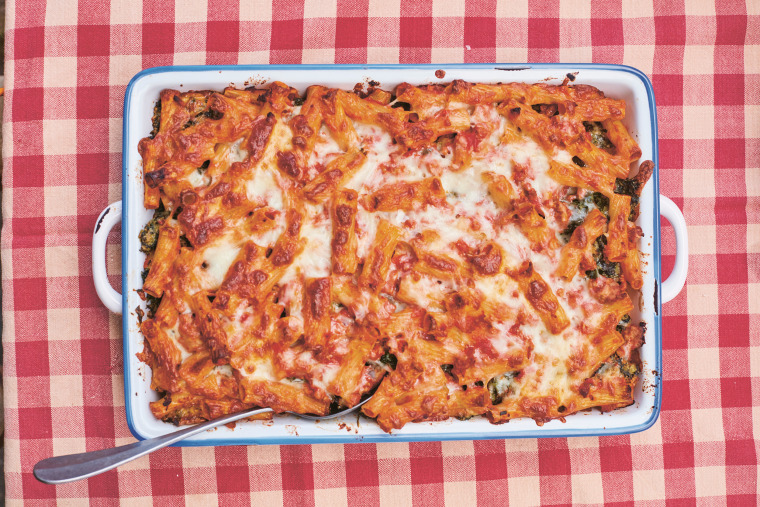 Who doesn't love a bubbly, cheesy baked pasta? This make-ahead baked pasta recipe from Julia Turshen can be made with ground turkey, beef, pork or chicken — or no meat at all. It calls for frozen spinach and canned crushed tomatoes, saving you last minute trips to the grocery store for fresh produce. "This is the best crowd-pleaser and a great thing to make ahead and pop in the oven right as your friends or family walk in the door," says Turshen. "It's filling and familiar and everyone loves it." "Weeknight recipes are all about simplicity," says FitMenCook founder and author of the new cookbook "Fit Men Cook", Kevin Curry. "And my salmon alfredo recipe is made with only five ingredients!" The dish is made with zucchini noodles instead of pasta so it's gluten free and low carb. Curry says it's a delicious way to try out the keto diet. If you tend to have more time in the morning than at the end of the day, you're probably already good friends with your slow cooker. And you need just 15 minutes in the morning to prepare these saucy turkey meatballs from Giada de Laurentiis. "Prep these in the morning and pop in the slow cooker to simmer all day," says de Laurentiis. "All they need come dinnertime is some freshly grated parm!" "You know all those bags of quinoa you have in your pantry that you almost regret buying because you have no idea how to use it?" asks Kevin Curry. "Trust me — I know the struggle!" His answer is this fast, protein-packed stir-fry with quinoa, black beans, shrimp, onion, garlic, peppers and a variety of dried spices. The basic recipe is almost endlessly customizable. "In fact, choose whatever grain and protein you have on hand and just add the flavors in this recipe!" says Curry. "I love having eggs for dinner," says Lindsay-Jean Hard, author of the new cookbook "Cooking with Scraps" and the Food52 column by the same name. Frittatas are particularly easy, she notes, because they have no crust (unlike quiche) and can be baked in the oven so they're largely hands-off. "Plus they're easily adaptable to whatever stragglers you have in the fridge — veggies, cheeses other odds and ends," says Hard. "One of my friends adds tater tots to hers and now I'm a convert. I add them in whenever I have them on hand." You don't even really need a recipe to make a frittata: Simply beat eggs with salt and pepper, scatter cooked vegetables and any other add-ins you like in a greased oven-safe skillet or pan, pour the egg mixture over the top and bake at 350°F until the eggs are set, about 15 to 20 minutes. Hard also likes mixing a little liquid or "liquidish" dairy, such as milk, plain yogurt or sour cream in with the eggs to improve the flavor and texture of the frittata, but that's optional.